Students in participating schools and communities write a story or a poem on his/her ideas of caring. Student then create an artwork according to the story. Students then design a class Service Learning project that demonstrates caring for others and take action to benefit the community and show how much they care about. 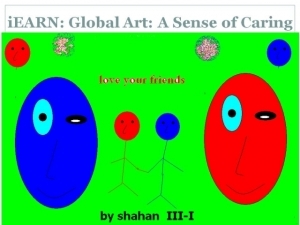 Students use different mediums including softwares to produce artwork on the theme of caring. Students can also take digital photographs that show what they care about and how they care for one another and other living things in their schools, families, communities and the world. Students will use these images along with text to create a PowerPoint or slide show for the story. Students share their completed projects in the project forum.